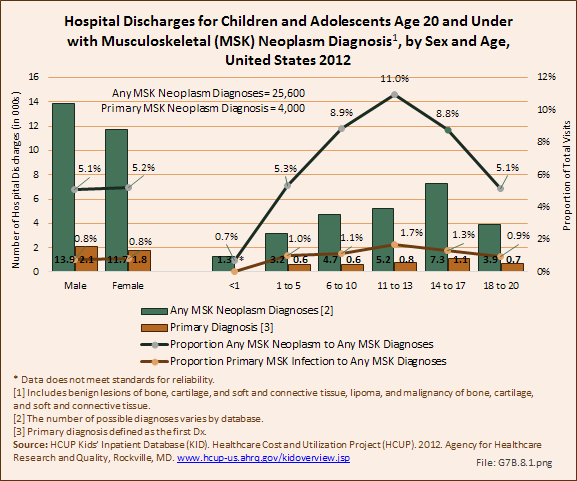 In order to perform a comprehensive review of the burden of musculoskeletal disease in children and adolescents, all conditions that either are direct musculoskeletal diagnoses or have musculoskeletal implications were considered for this section. 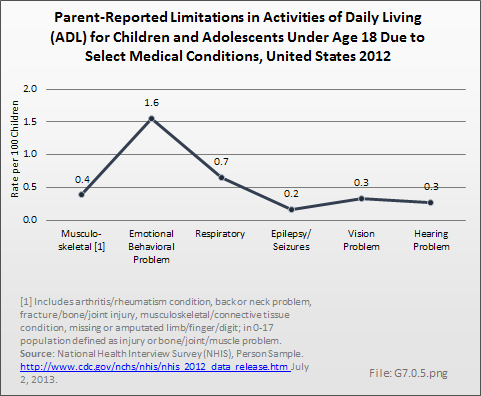 This chapter was divided into separate clinically relevant sections to better understand the burden of each. 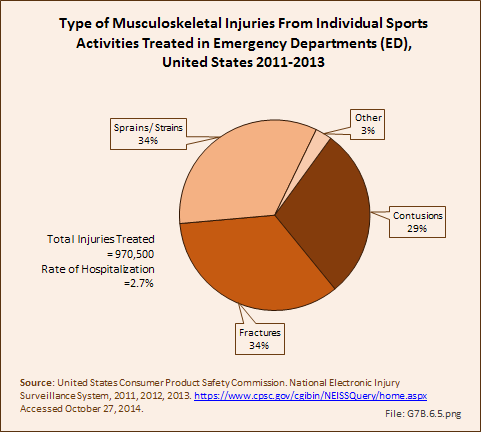 These sections include musculoskeletal infections, deformity, trauma, neuromuscular conditions, syndromes with musculoskeletal implications, sports injuries, skeletal dysplasias, neoplasms, rheumatologic conditions, medical problems with musculoskeletal implications, and pain syndromes. 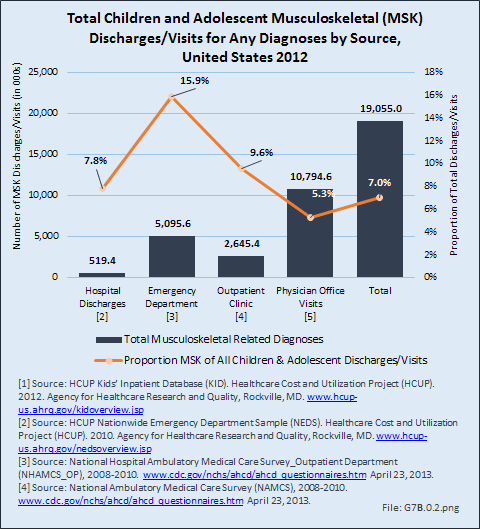 Health care visits and hospitalization data are derived from diagnostic codes for each of the conditions presented. 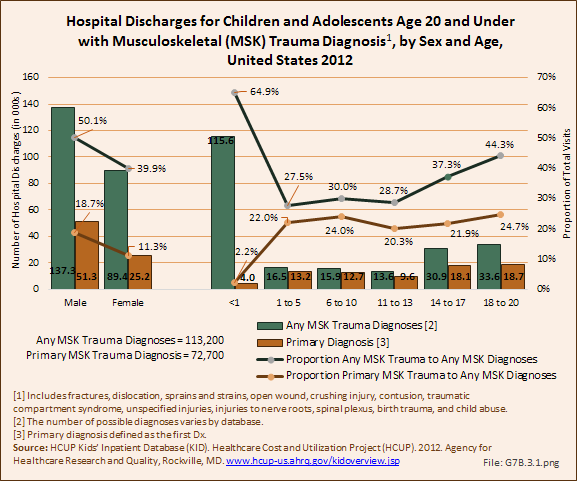 These codes are available in the ICD-9-CM Codes section of this topic. 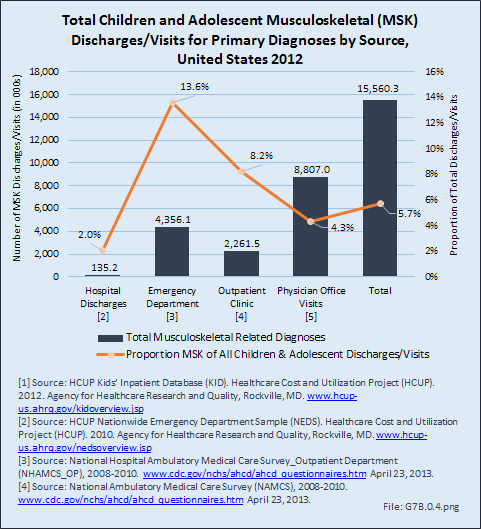 Total health care visits are the sum of cases seen in physicians’ offices, outpatient clinics, emergency departments, and hospital discharges. 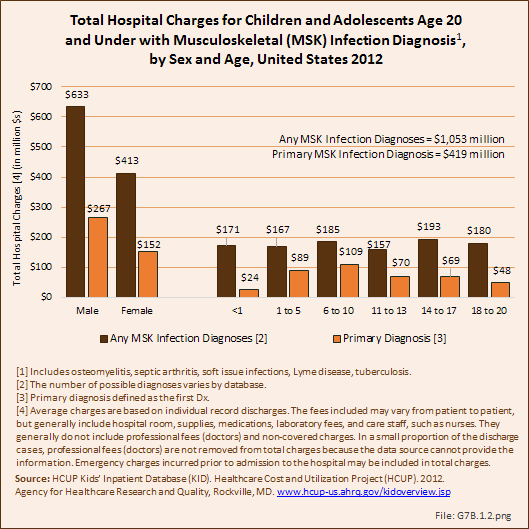 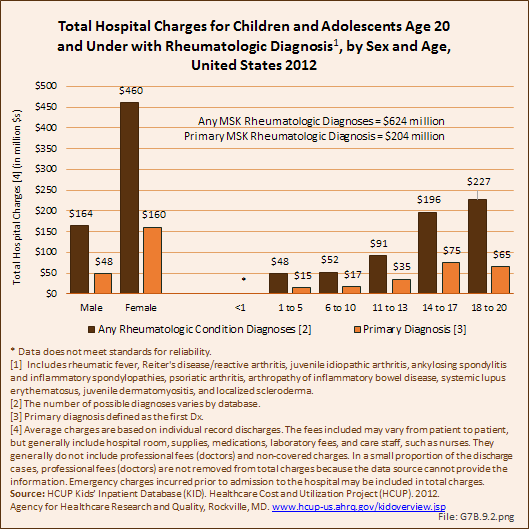 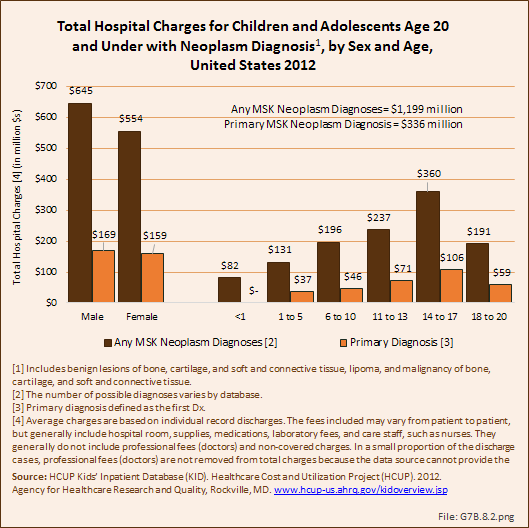 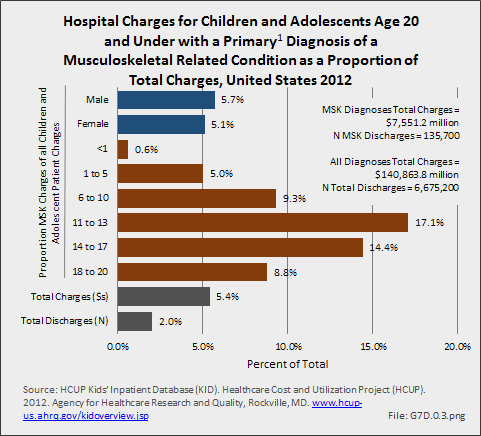 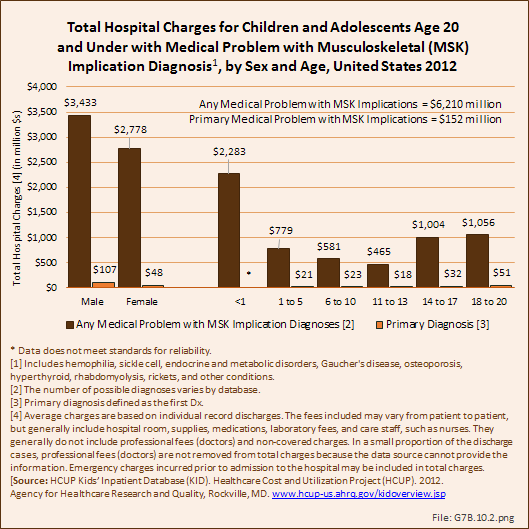 The largest database used is the Healthcare Cost and Utilization Project (HCUP) Kids’ Inpatient Database (KID), which includes nearly 6.7 million weighted records of children and adolescents through the age of 20 years. 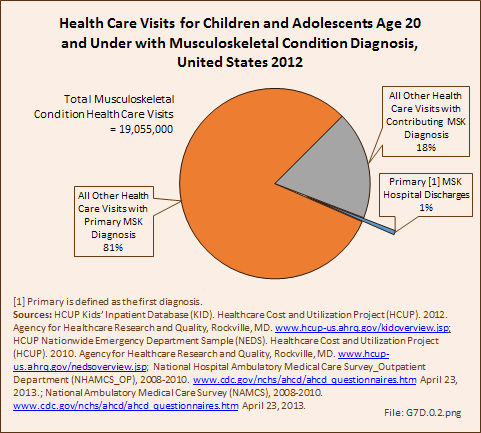 All databases were analyzed for the ages 0 through 20 years, with subsets of data by age groups under 1 year, ages 1 through 5 years, 6 through 10 years, 11 through 13 years, 14 through 17 years, and 18 through 20 years. 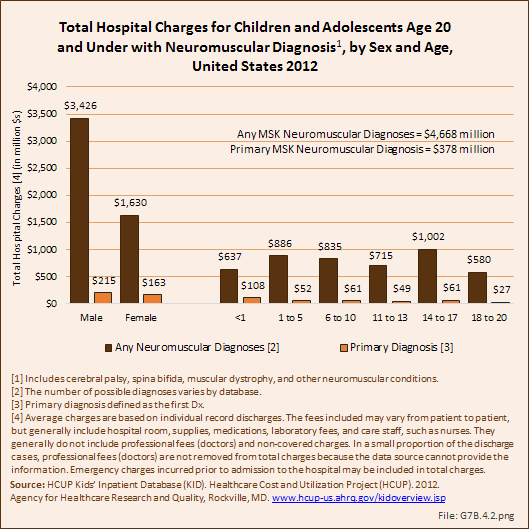 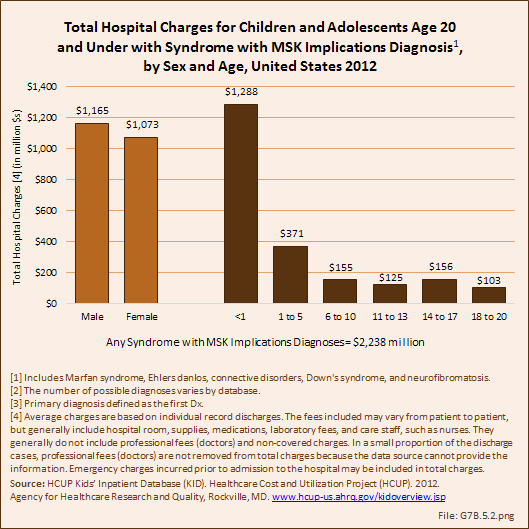 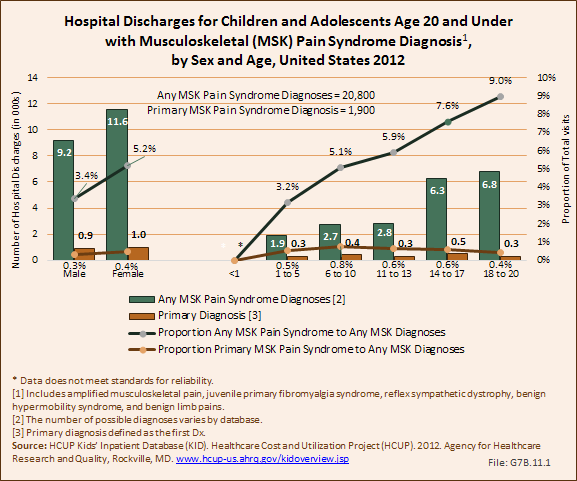 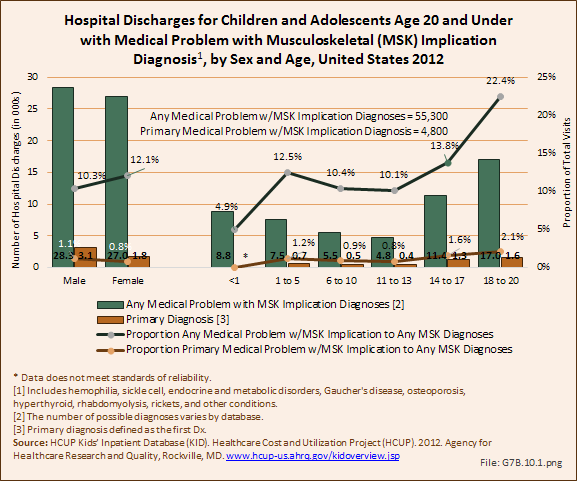 Each database includes multiple variables to define diagnoses, ranging from three possible diagnoses in the physicians’ office and outpatient clinic data sets to 25 possible diagnoses in the KID database. 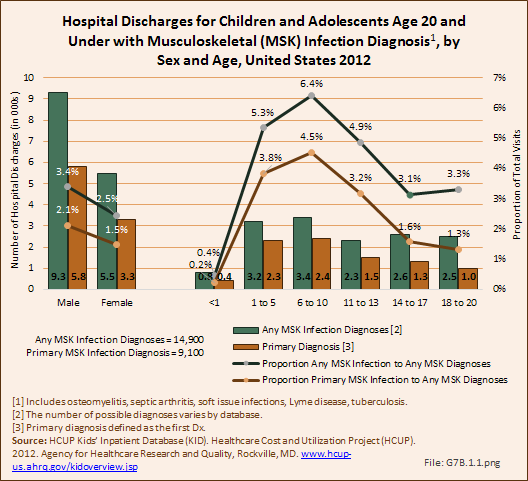 If a diagnosis code is listed in any of the possible diagnoses variables, the record is coded as presenting with that condition. 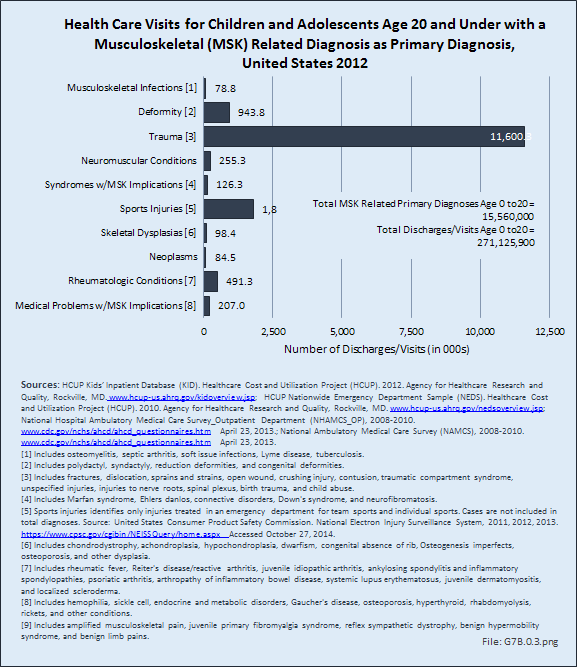 If the diagnosis code is listed in the first diagnosis variable, it is coded as the primary diagnosis. 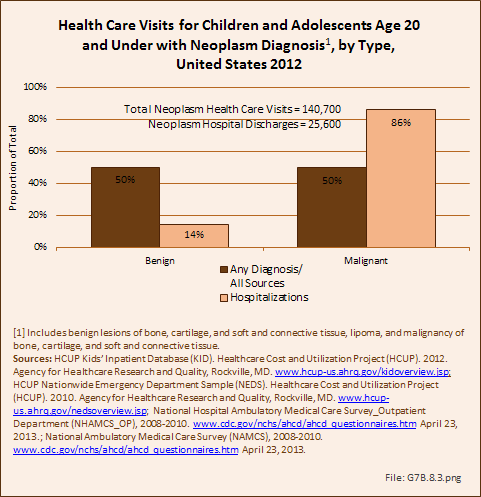 However, the databases do not permit diagnostic verification. 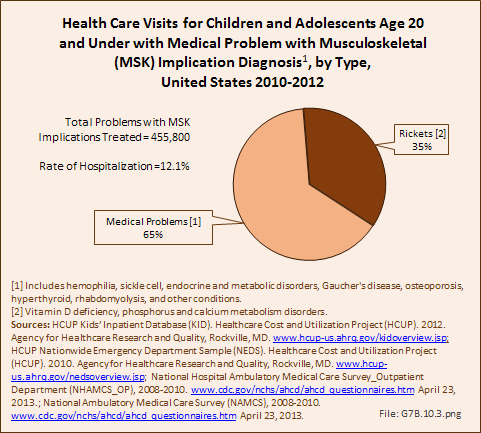 The first diagnosis listed may not be the primary reason for the visit, but a contributing cause. 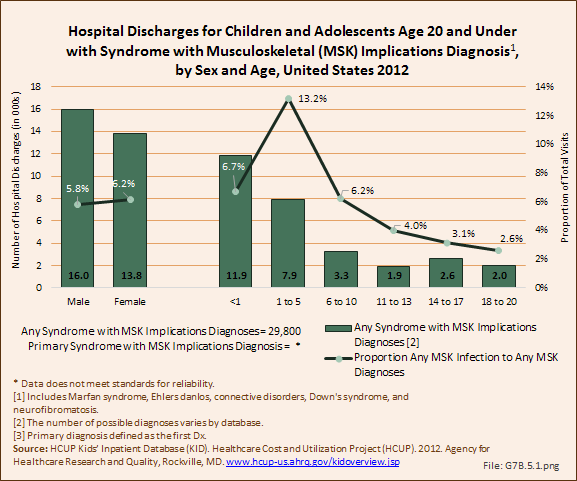 Further, there is the potential for overlap in diagnosis of related conditions. 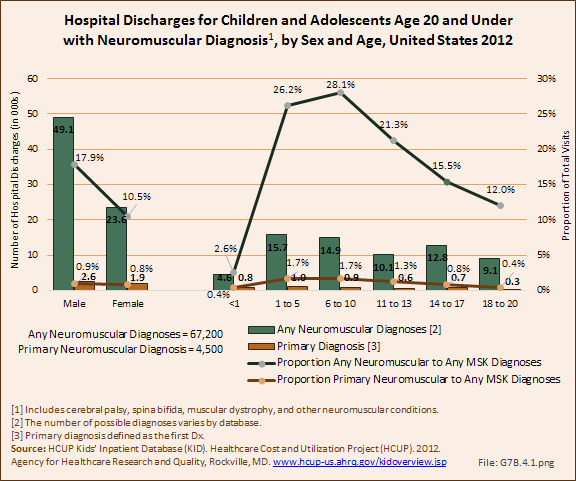 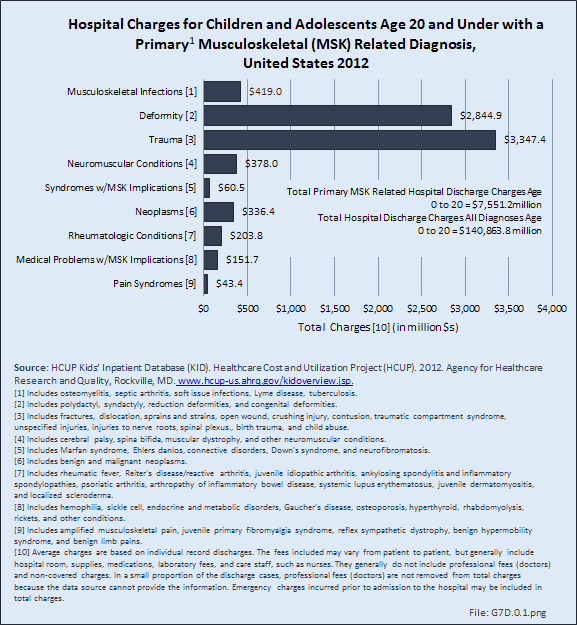 Finally, sometimes diagnoses are provided primarily for reimbursement purposes, with little emphasis on accuracy. 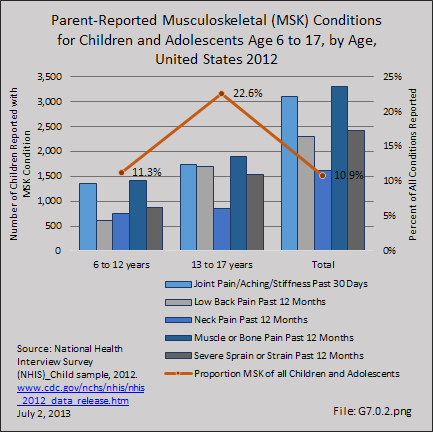 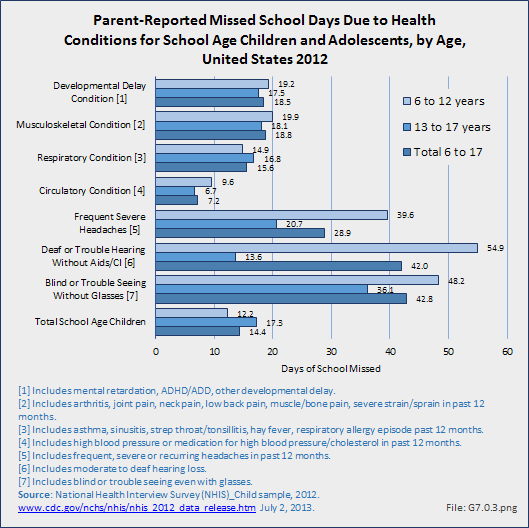 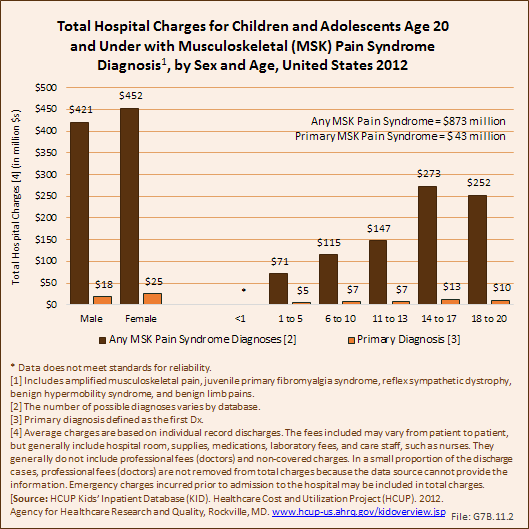 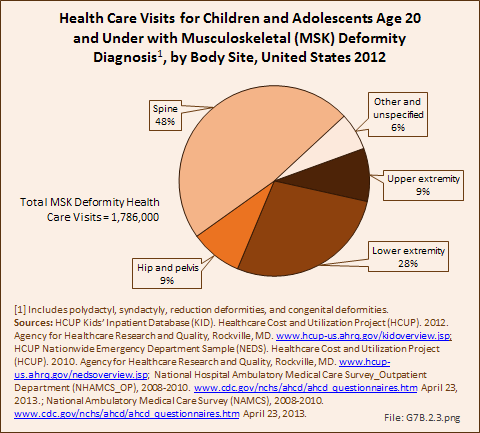 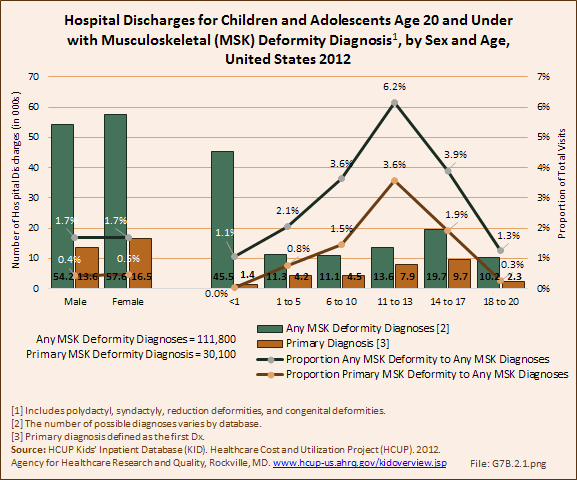 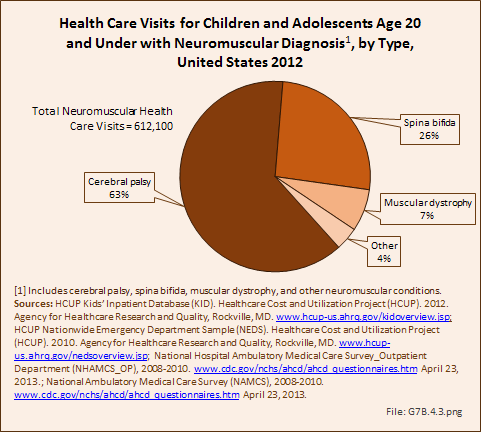 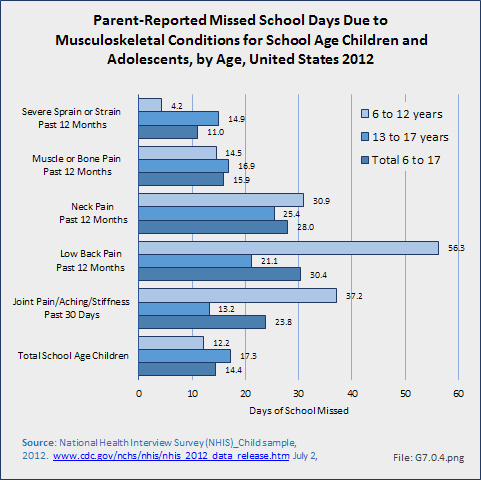 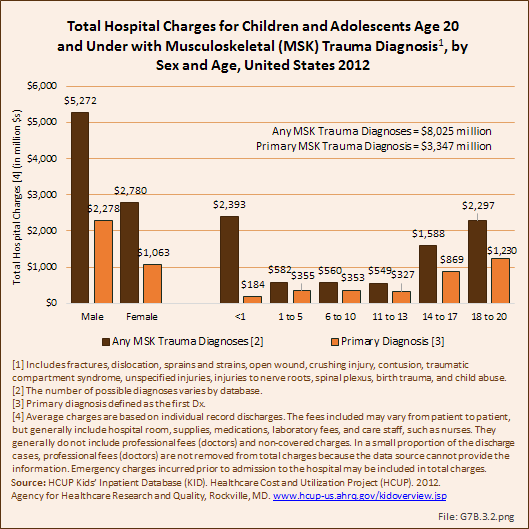 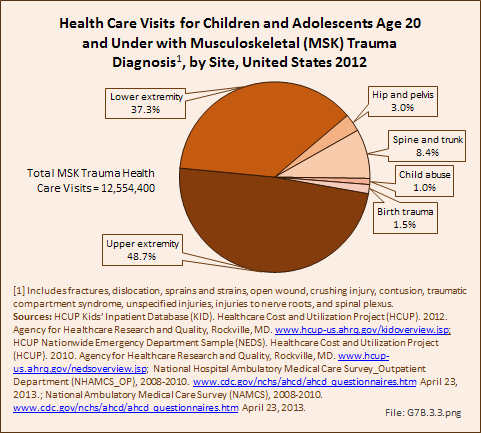 Therefore, these numbers provide only a guide to the impact of major childhood musculoskeletal conditions. 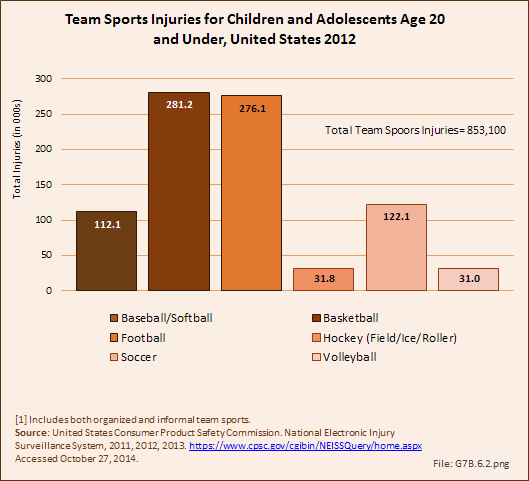 Injuries include two categories: sports injuries and all injuries due to a traumatic event. 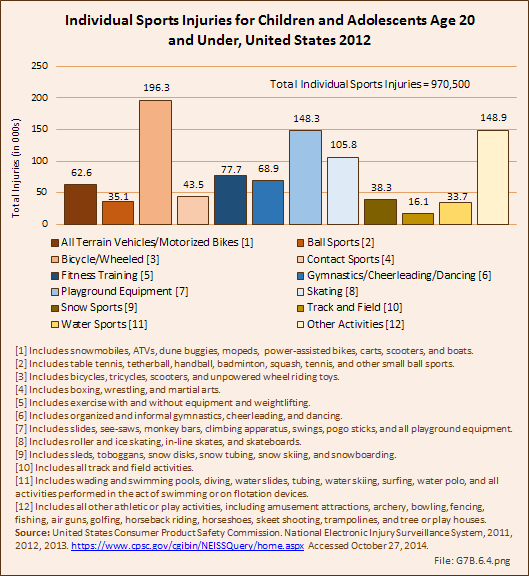 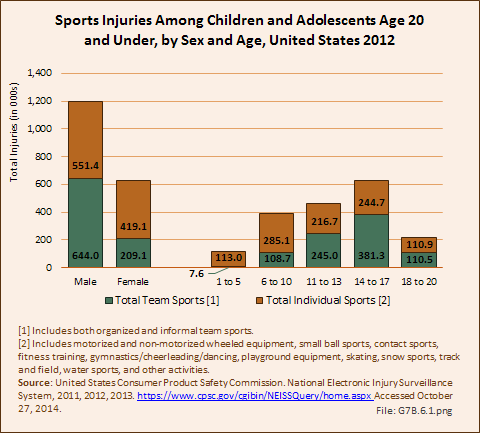 Sports injuries are identified by type of sports activity using the United States Consumer Product Safety Commission’s National Electronic Injury Surveillance System (NEISS), with annual injuries averaged across the years of 2011 to 2013. 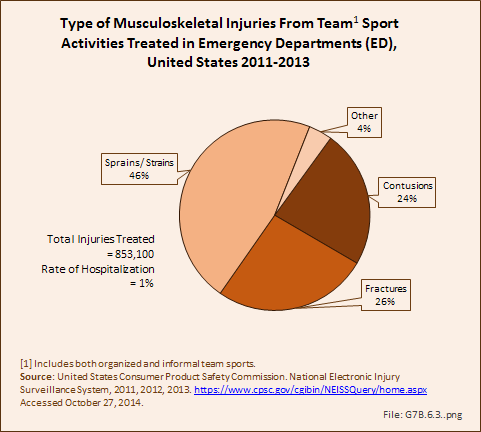 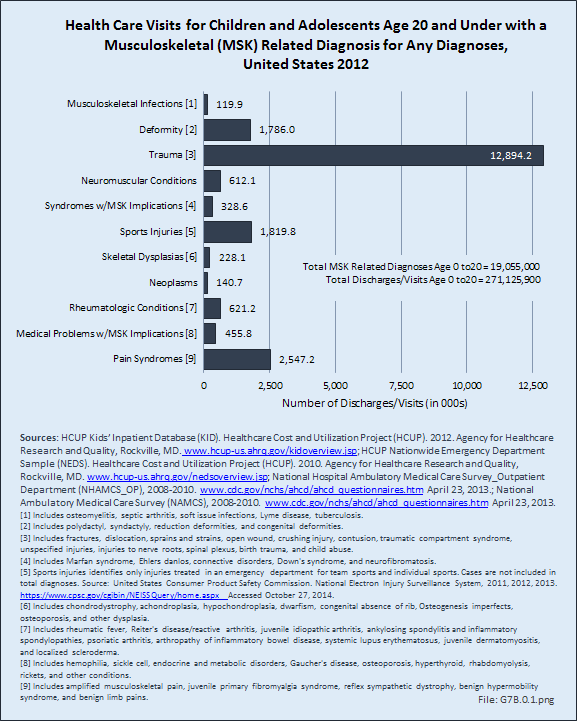 Because sports injuries cases are not analyzed by ICD-9-CM codes, they may duplicate trauma injury cases.